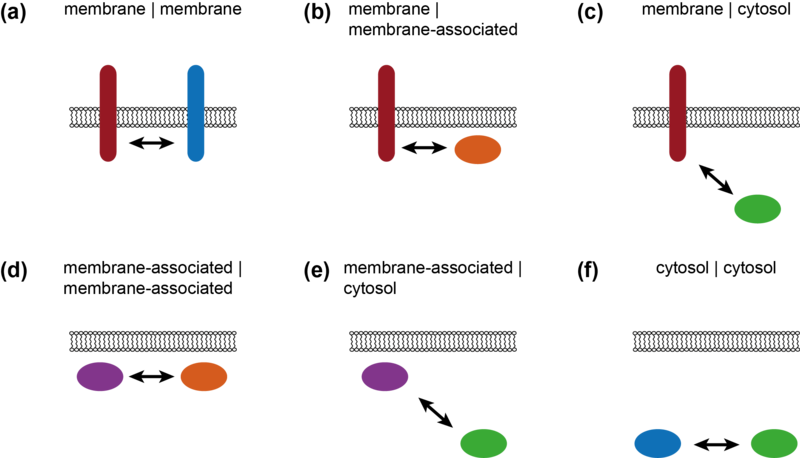 The Custom targetSCREENER Assay includes designing and developing a cell -based protein-protein interaction assay using two candidate proteins of choice. The targetSCREENER Assay is based on the versatile splitSENSOR technology, which has enabled the development of robust, reliable and high-throughput-friendly cell-based assays using the luc2 firefly luciferase gene (Fluc) as final readout. For the custom targetSCREENER Assay, one of the candidates is a membrane protein, a membrane associated protein or strictly cytosolic. The second candidate may be of any localization. Newly developed targetSCREENER Assay components will be tested in heterologous cell lines, such as HEK293 or PC12 cells. An inducible interaction will be tested with agonists and/or antagonists, followed by luciferase readings. The Custom targetSCREENER Assay is based on the splitSENSOR technology, which is a highly sensitive, flexible and easy-to-use reporter assay system to robustly and quantitatively monitor activities of dynamic protein-protein interactions in living cells. The technology is based on the functional complementation of TEV protease fragments fused to interactions partners of choice. For example, a receptor is fused to the NTEV fragment, a TEV protease cleavage site (tevS) and the artificial transcriptional co-activator GAL4- VP16 (GV). A cytosolically localized adapter protein is fused to the CTEV fragment. 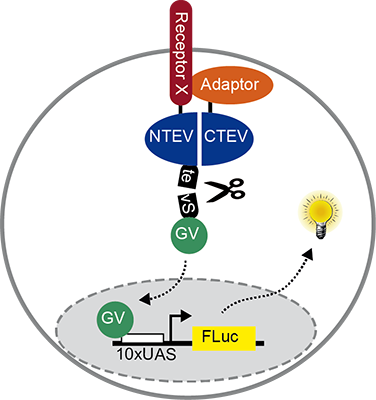 An activation-dependent interaction between the receptor and the adapter causes the NTEV and CTEV fragments of the TEV protease to reconstitute its proteolytic activity. Next, GV is released and translocates to the nucleus where it binds to upstream activating sequences (10xUAS) to initiate transcription of the firefly (Fluc) reporter gene. In turn, Fluc catalyzes the reaction of the substrate luciferin to oxyluciferase and light, enabling a quantitative readout. Our Systasy Service team will work closely with you to develop a customized cell-based assay tailored to your selected target, providing comprehensive solutions where you need them most. However, our Service team cannot guarantee that a newly developed custom assay will result in any activity, nor in an inducible activity required for high-throughput applications.